June 19, 2010 — Today, U.S. 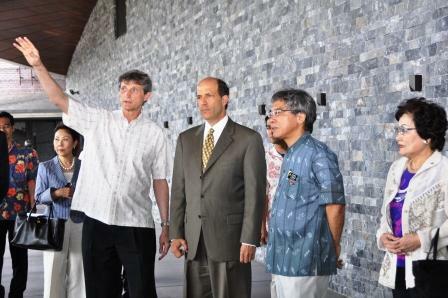 Ambassador to Japan John V. Roos visited the Okinawa Institute of Science and Technology (OIST) in Onna Village, Okinawa to discuss areas for cooperation with OIST by the U.S. Embassy and U.S. Consulate-General Naha. OIST is a new graduate university developed under the OIST School Corporation Act to conduct world-class research and education in science and technology in Okinawa in order to contribute to the sustainable of Okinawa. After touring the OIST facility, Ambassador Roos met with OIST staff to discuss possible cooperative initiatives designed to promote establishment of an intellectual cluster for emerging technologies in Okinawa. He applauded the important effort that OIST is undertaking to host an international symposium this fall in support of its mission to conduct research and training in areas to produce new technologies for fostering economic development and promoting a cleaner environment, and conveyed his willingness to assist in inviting leading authorities to participate in the symposium. He also pledged to work together with OIST to expand the bilateral exchange of researchers and students in science and technology. Ambassador Roos further expressed his hope that OIST could actively contribute to the vision of bilateral cooperation in clean energy development that the U.S. and Japan expressed during President Obama’s visit to Japan last November, particularly the Memorandum of Cooperation Creating the Hawaii-Okinawa Partnership on Clean and Efficient Energy Development and Deployment (“Clean Islands Partnership”), by applying innovative life science approaches to the search for new technologies and energy sources, advancing smart grid systems and microbial fuel cells research, and introducing the latest energy conservation building technologies to Okinawa.